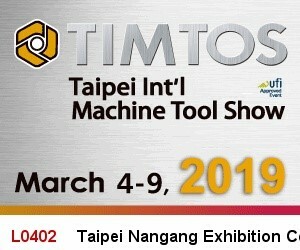 Home > News > The 27th Taipei Int'l Machine Tool(TIMTOS) Show will be held at Taipei, Nangang Exhibition Center from Mar 4 to 9, 2019. In order to serve customers around the world, Eyan Machine Tools Co., Ltd. will exhibit various types of sharpening machine at TIMTOS 2019 Taipei, TAIWAN (Nangang Exhibition Center). End Mill Sharpener EY-32C, Precision Drill Sharpener EY-32BL, Saw Blade Chip Break Machine BR-650, Saw blade Sharpening Machine S450, Chamfering machine BW-650, CNC Circular Knives& Slitting Knives Grinder CVH-500D 2A, CNC Saw Blade Sharpener EMA-500 4A, Circular Knives& Slitting Knives Grinder CV-450, and Friction Saw Blade Sharpening Machine SU-1200.